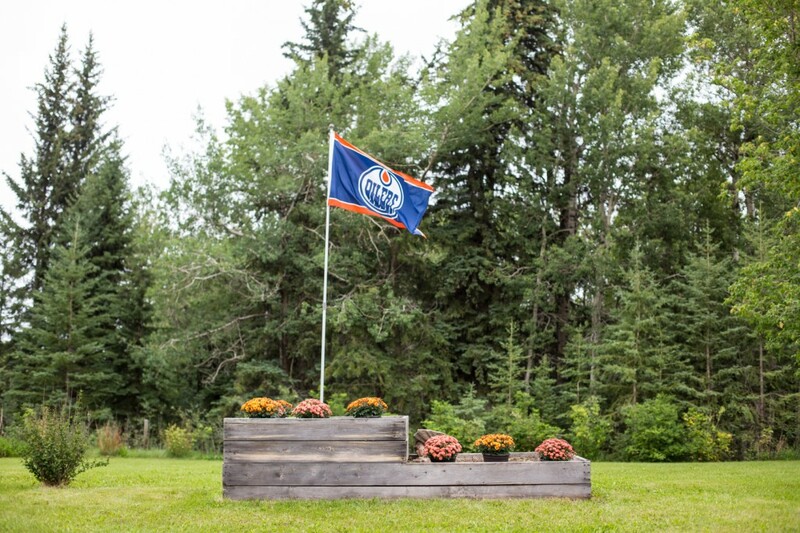 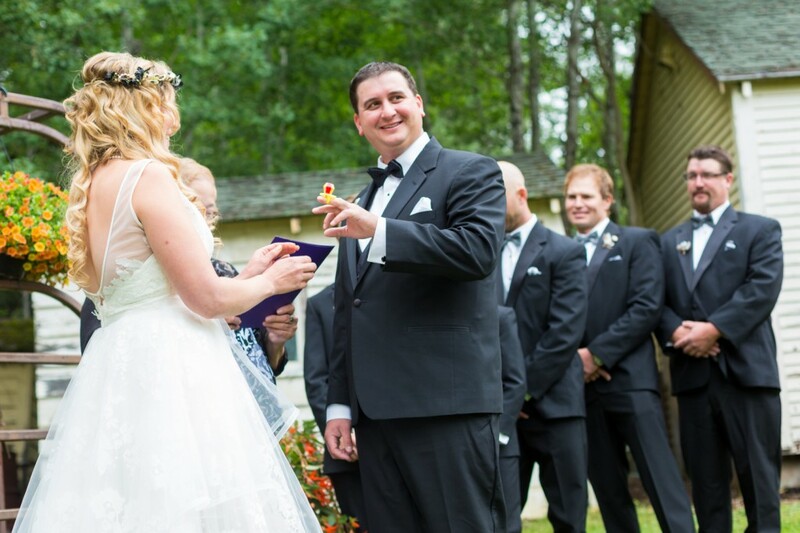 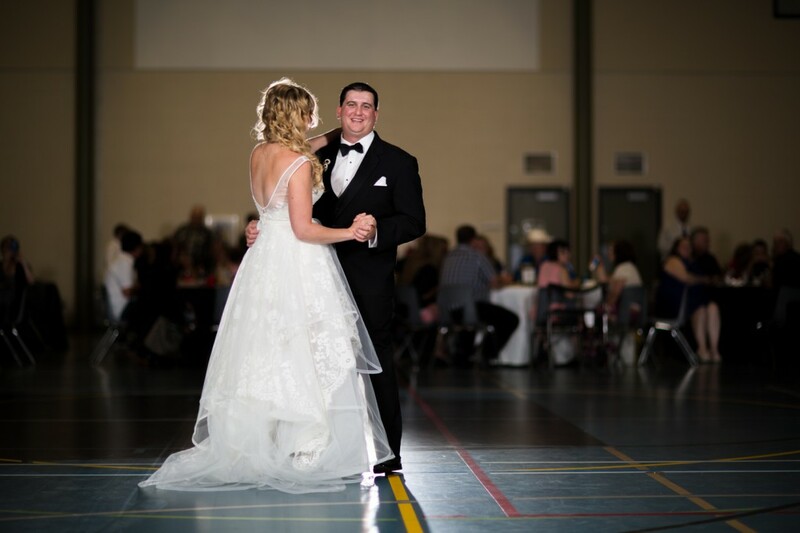 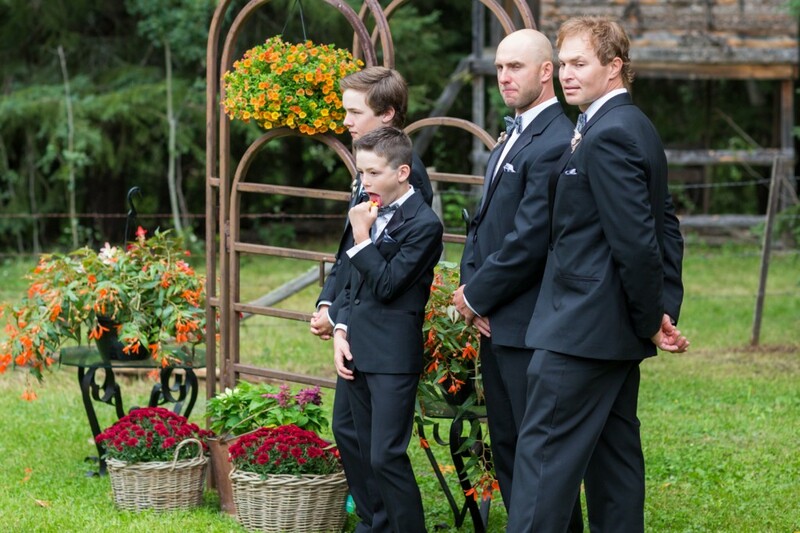 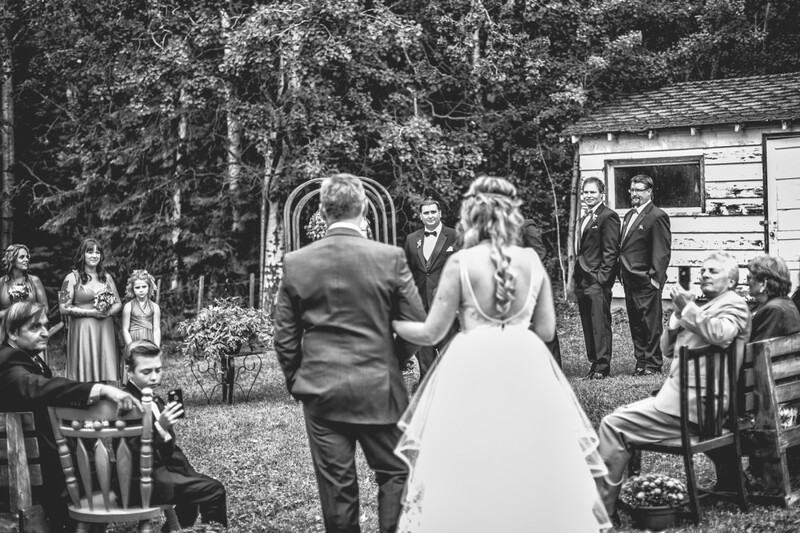 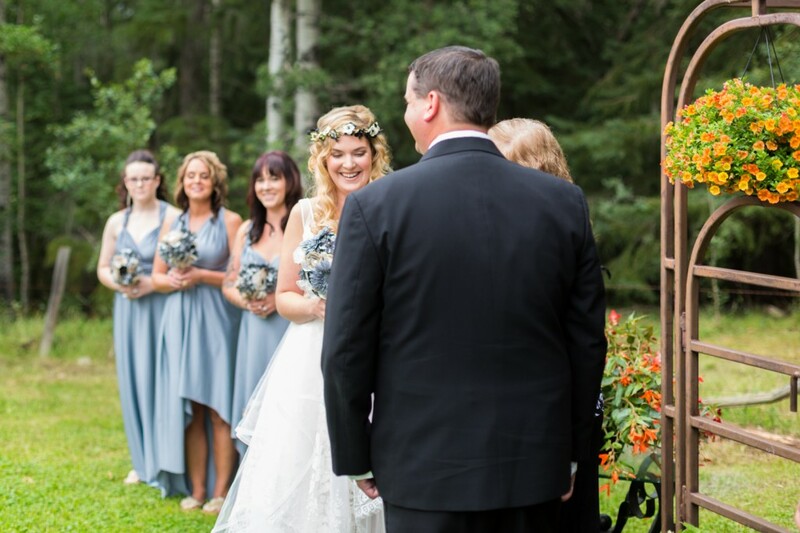 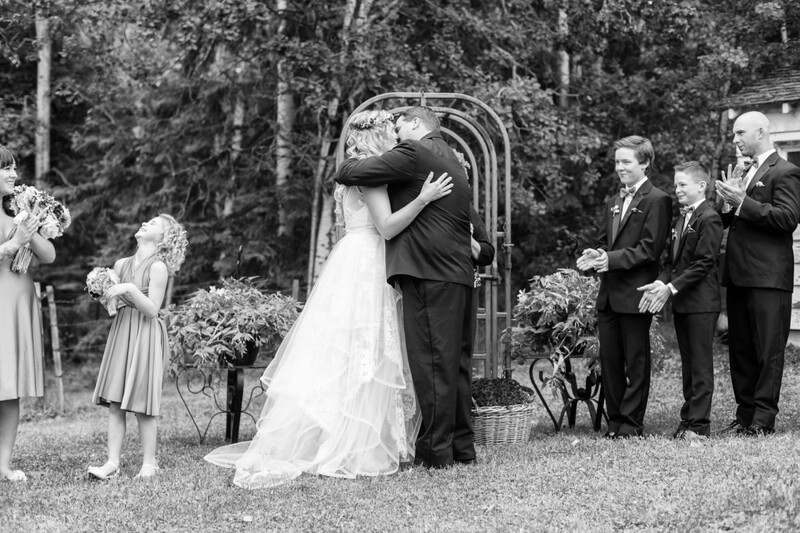 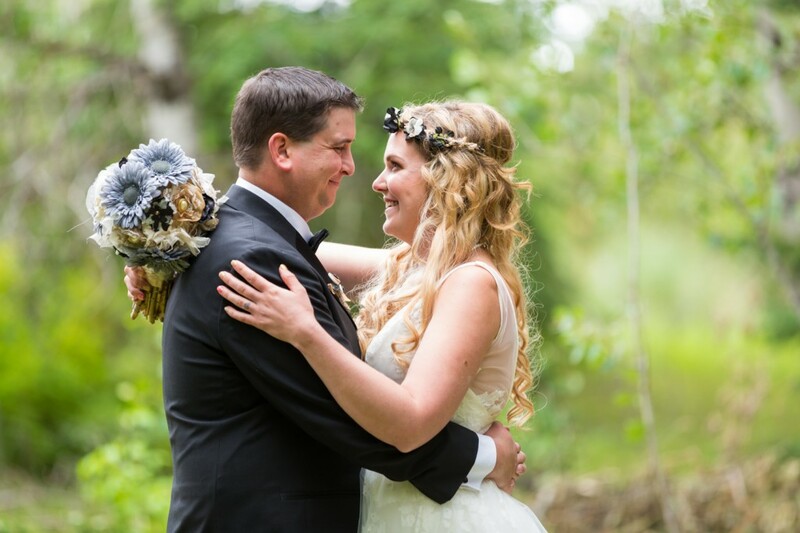 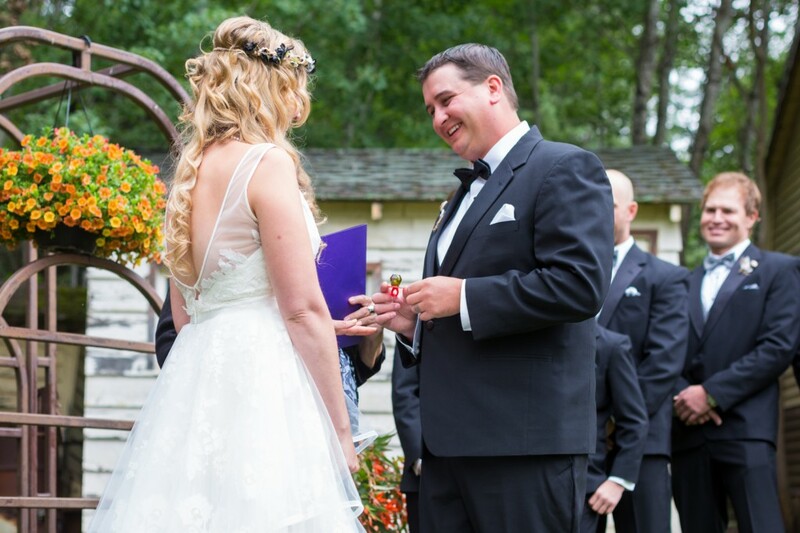 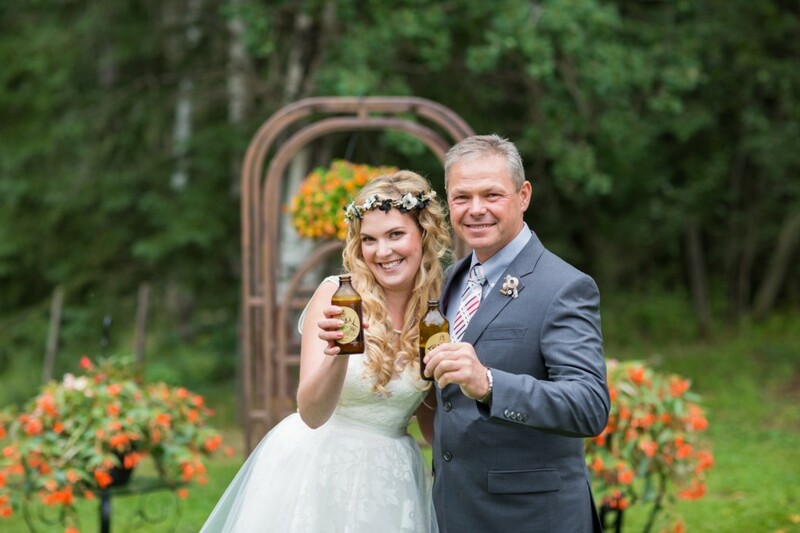 Kris and Kelsey’s beautiful country wedding in Athabasca was a reflection of their down to earth personalities and their love for each other. 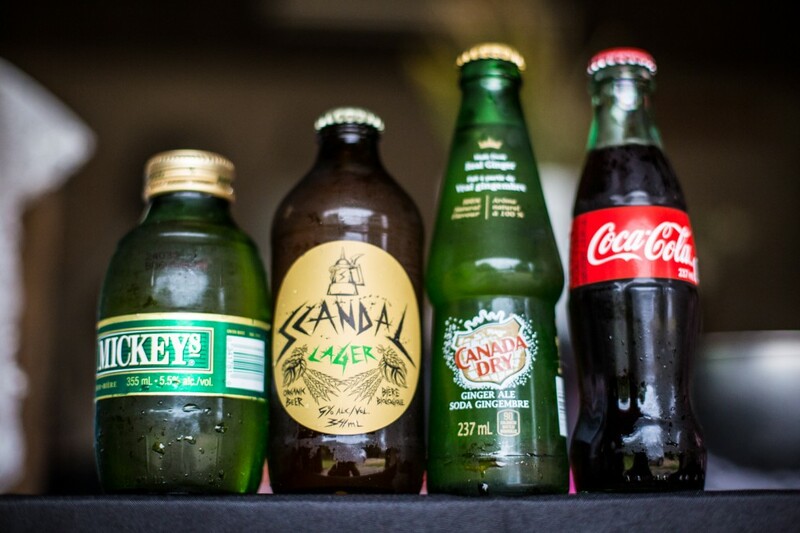 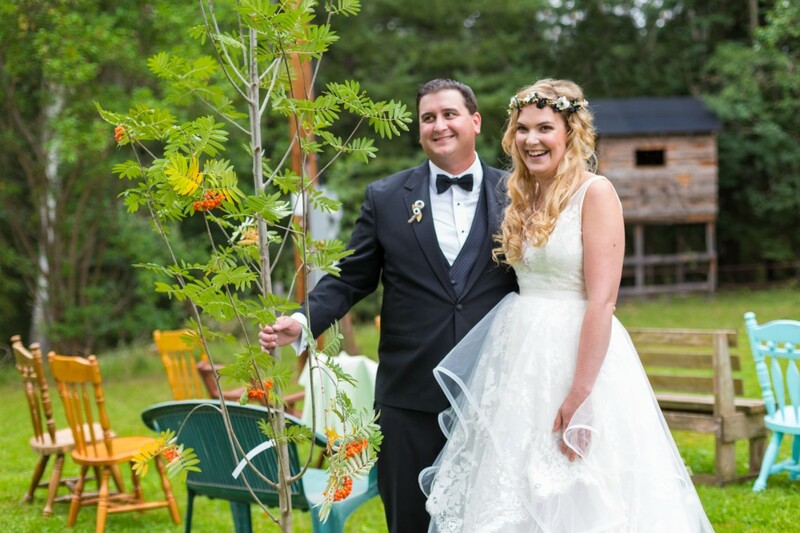 Kelsey is the ultimate DIY bride. 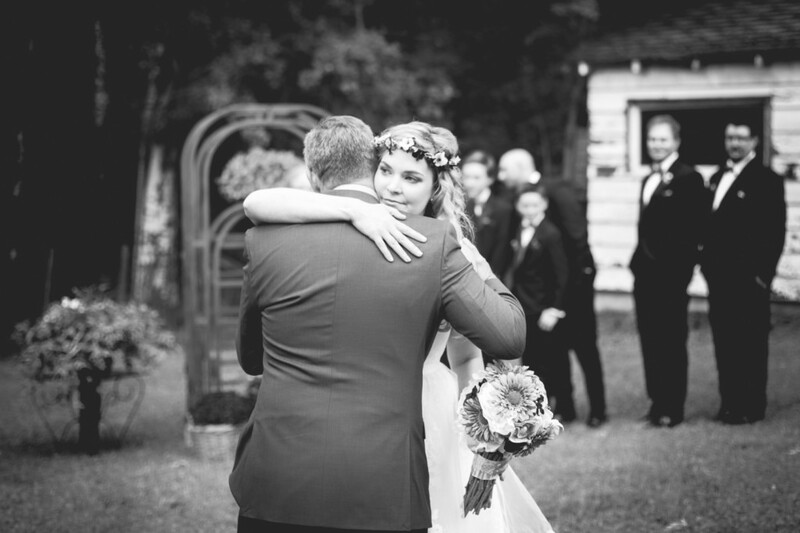 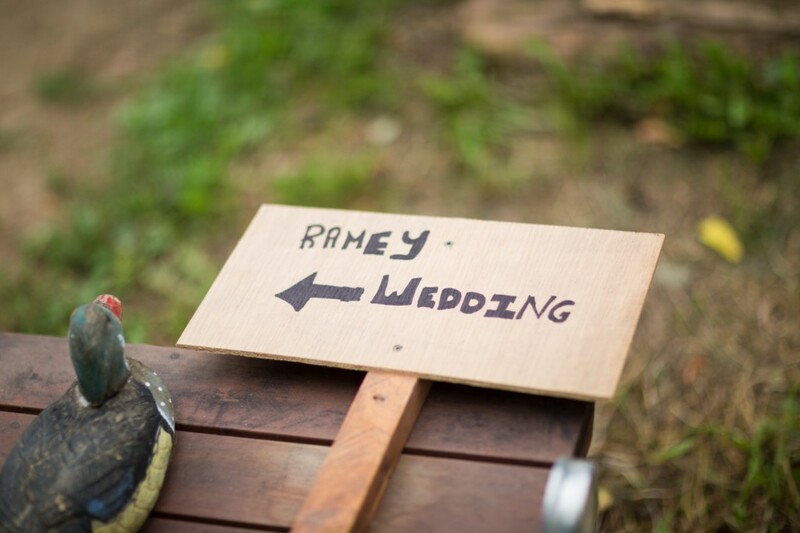 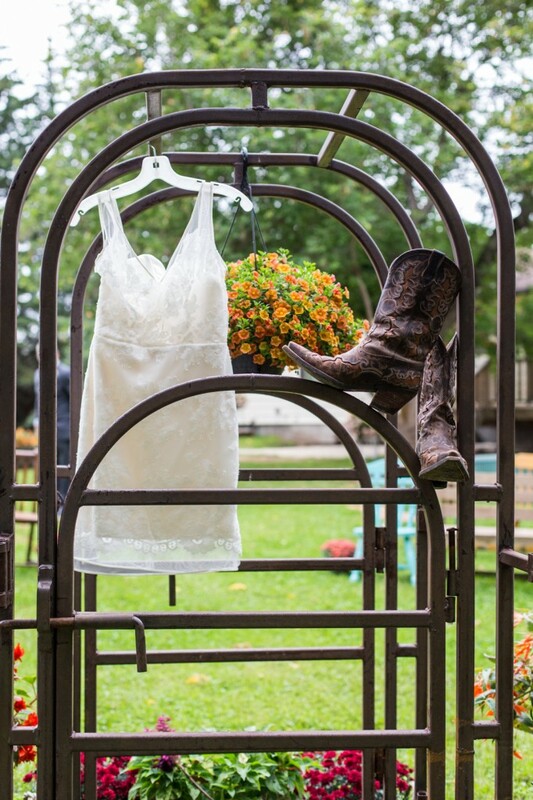 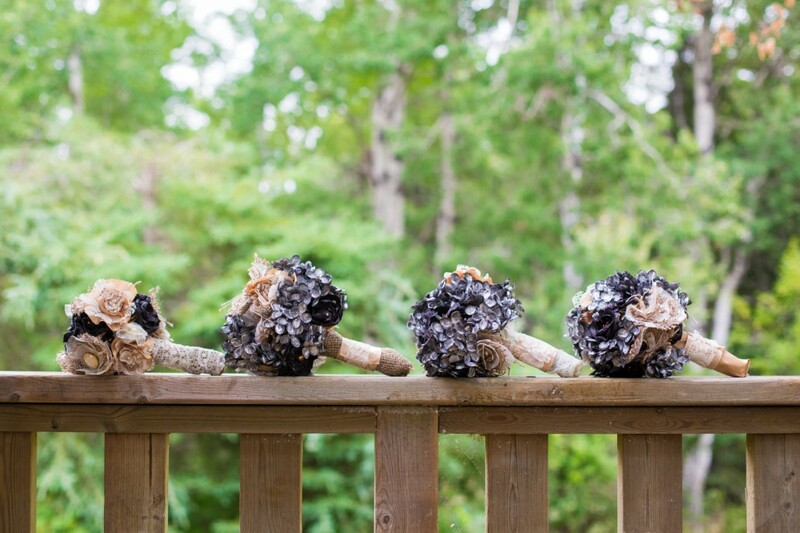 She spent months creating her vision for a rustic country wedding ceremony. 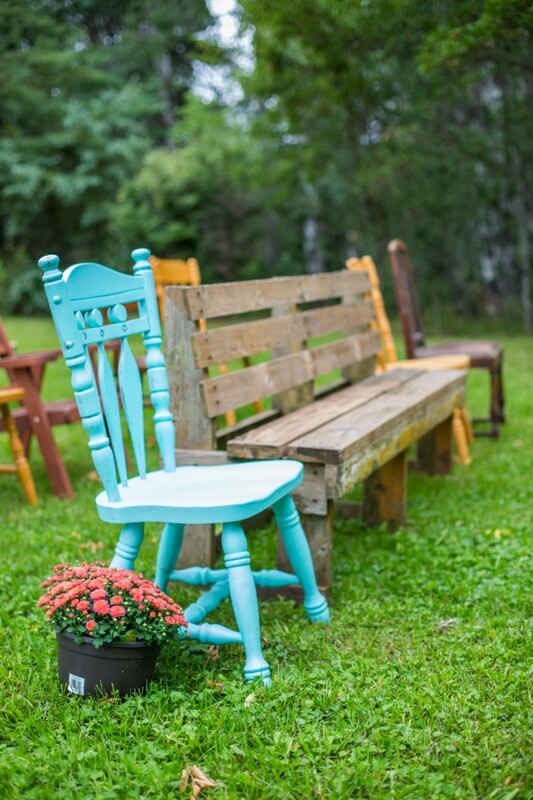 This included collecting and refinishing old kitchen chairs, and creating all of the flowers for the bouquet and boutonnieres by hand. 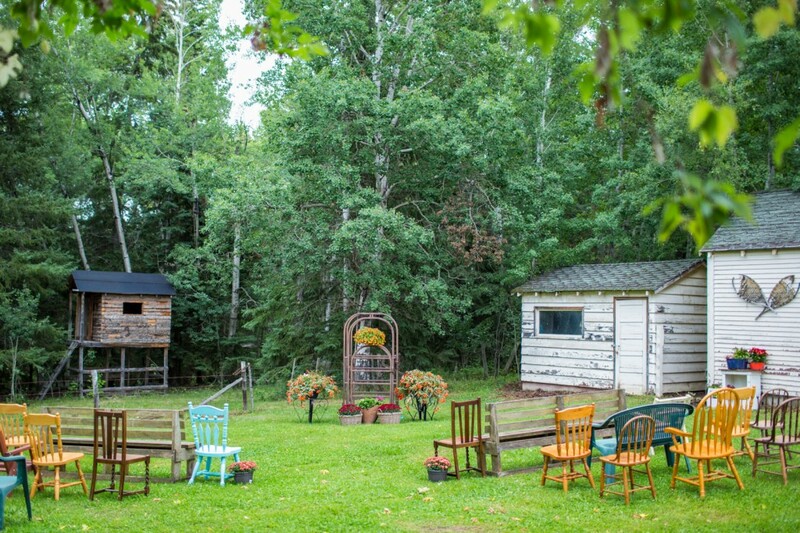 Athabasca is a hidden gem in the Alberta landscape, full of thick forests and rolling farmland. 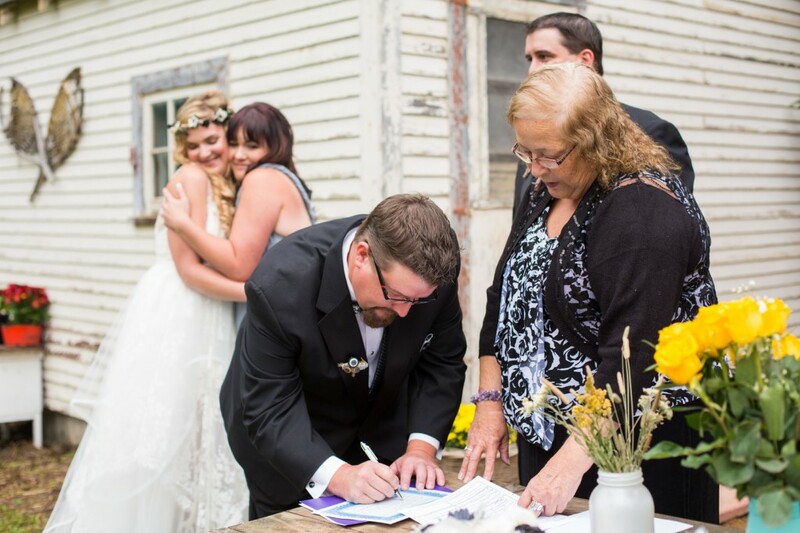 Kris and Kelsey wanted to embrace their love of the natural landscape by inviting their guests to an intimate wedding ceremony at their new farm just south of town. 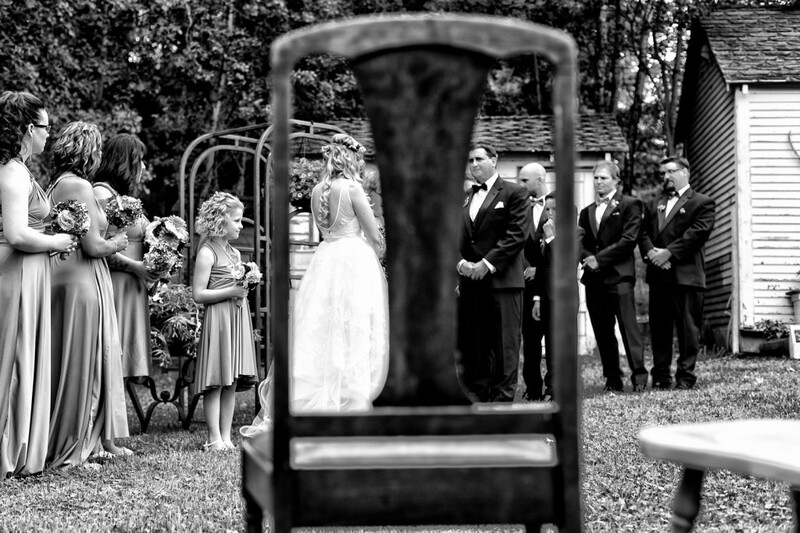 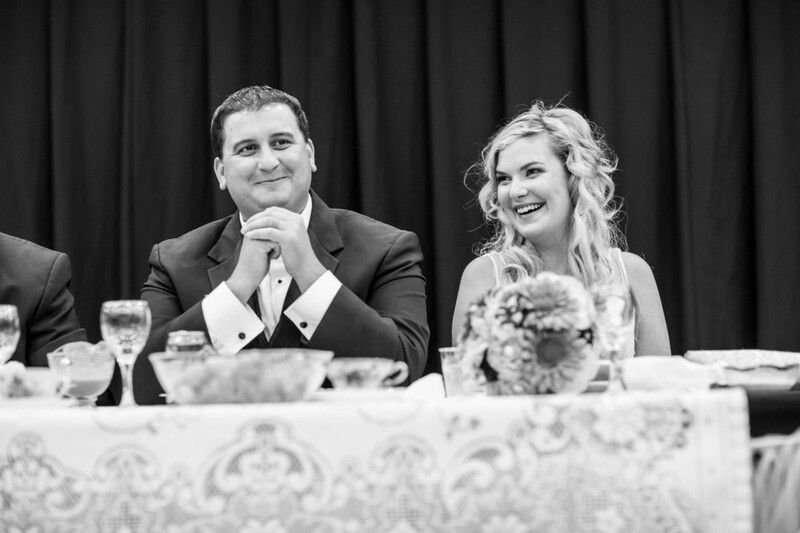 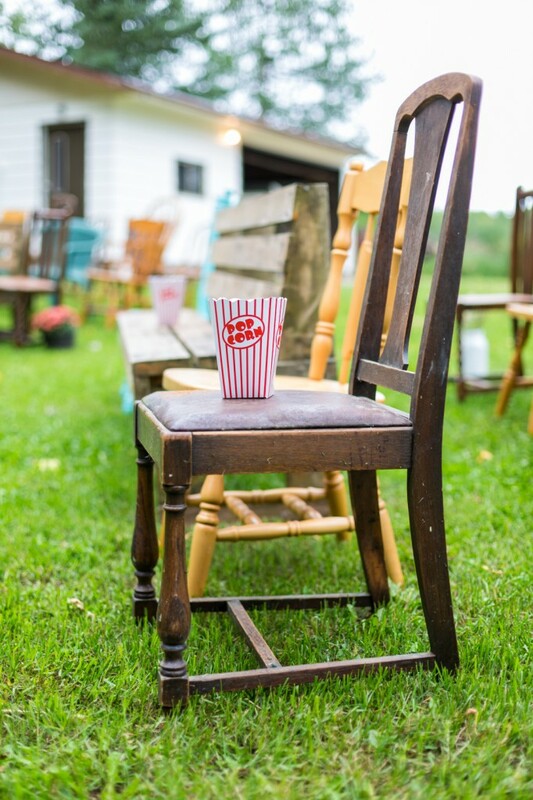 Seated on benches and an assortment of rustic kitchen chairs, guests joined Kris and Kelsey as they exchanged their vows – and ring-pops. 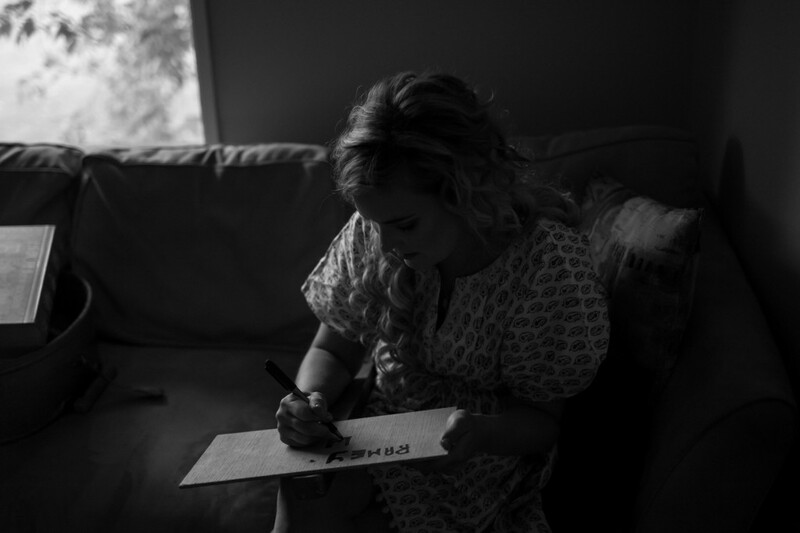 Kris and Kelsey have matching wedding band tattoos. 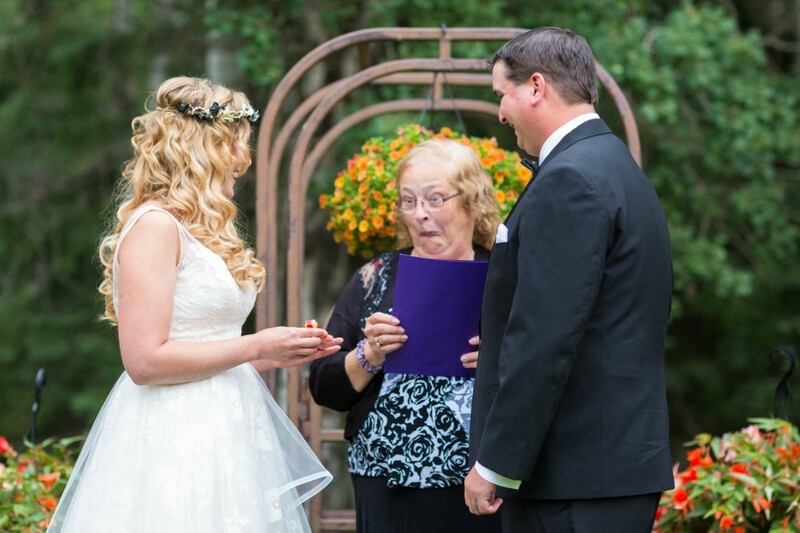 Instead of exchanging rings during the ceremony they lightened things up with some good ol’ fashioned ring-pops. 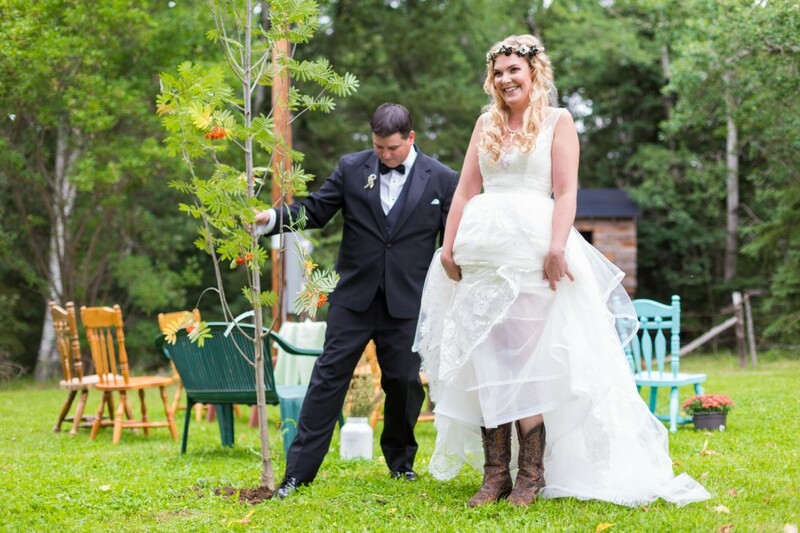 After the ceremony to celebrate their growing family Kris and Kelsey, along with Kris’ two sons, planted a mountain ash tree beside their home. 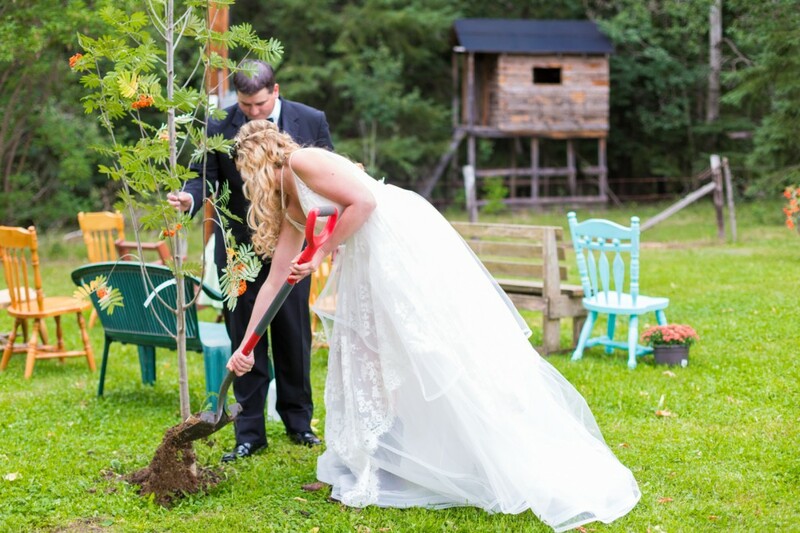 This tree would stand as a lasting reminder of their wedding vows and commitment to each other. 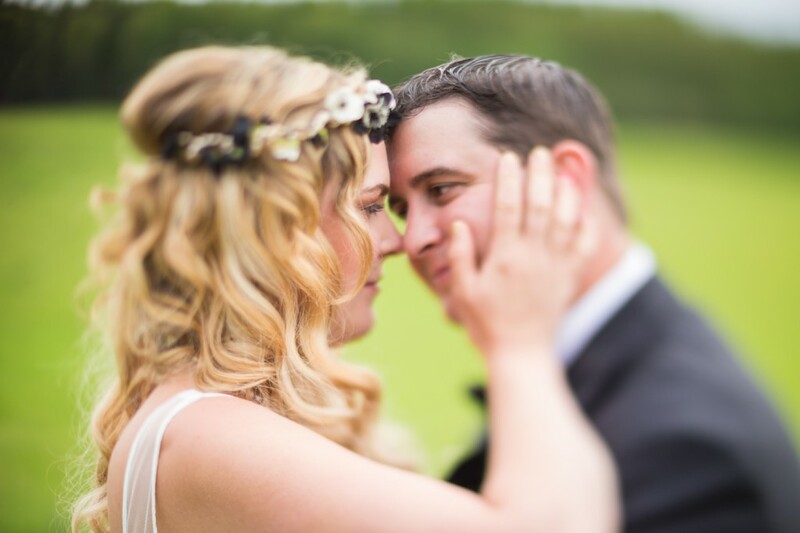 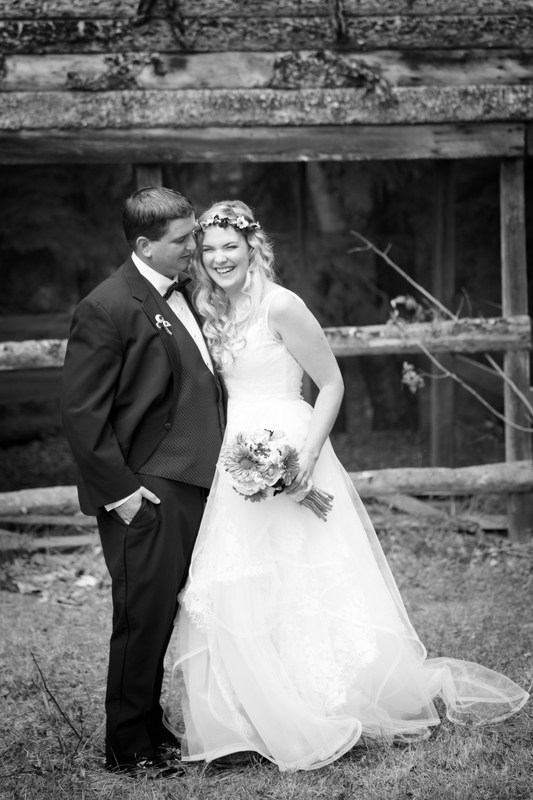 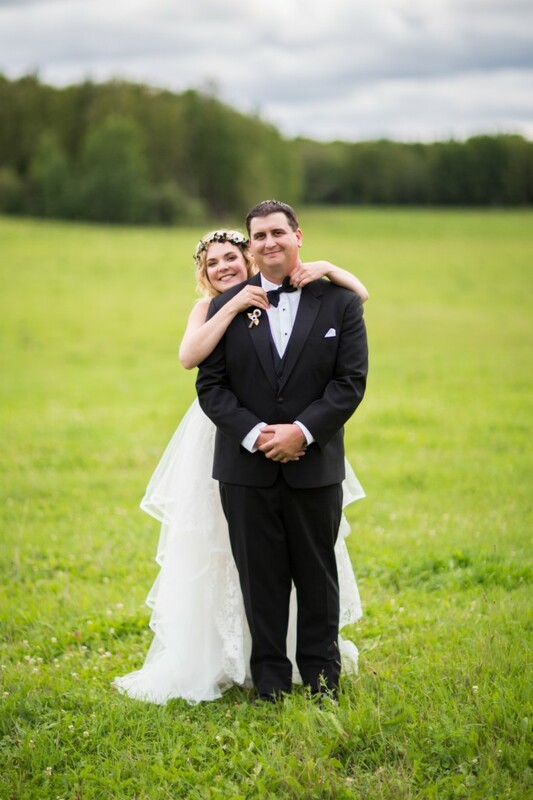 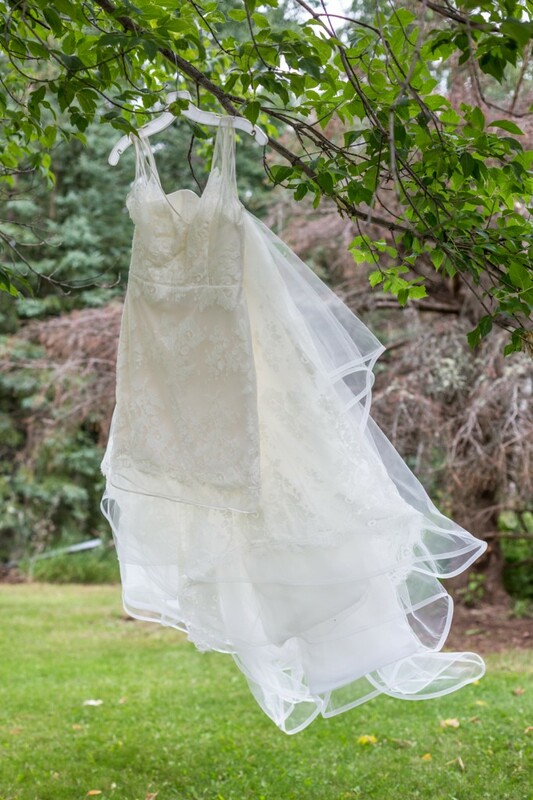 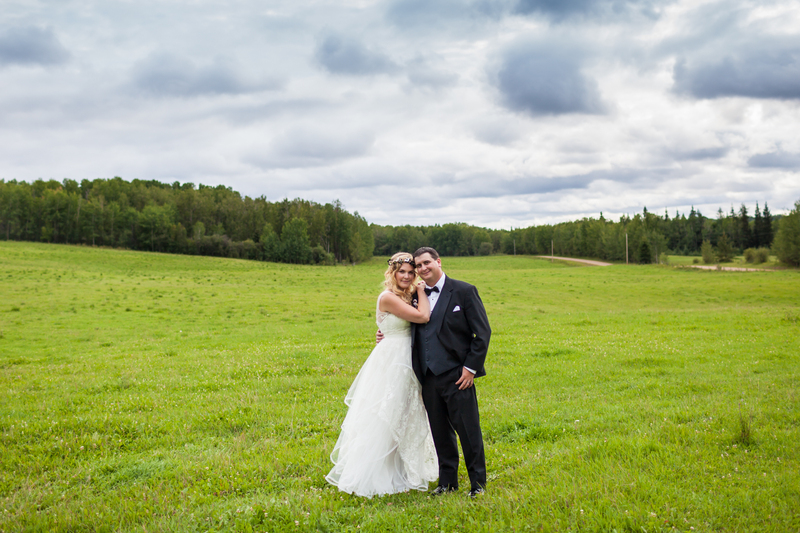 Their beautiful acreage was the perfect backdrop for rustic and intimate wedding portraits. 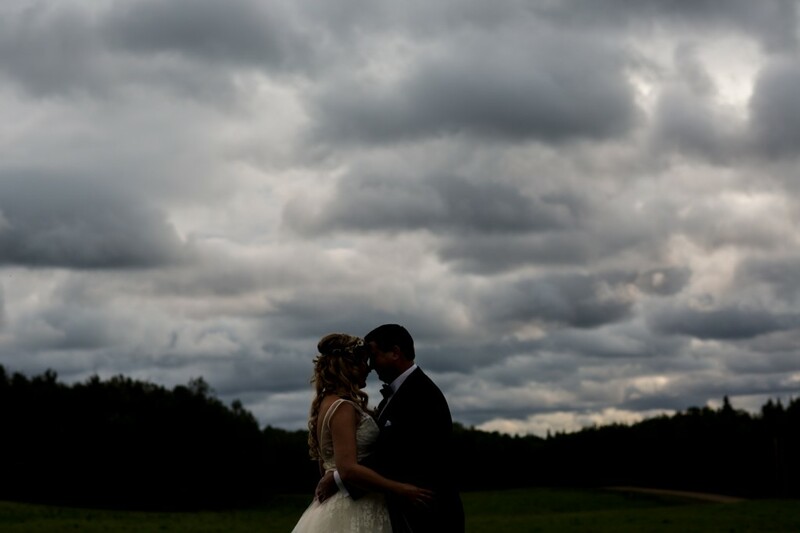 With a forest full of trees reaching skyward and vast stretches of open fields, we had plenty to work with. 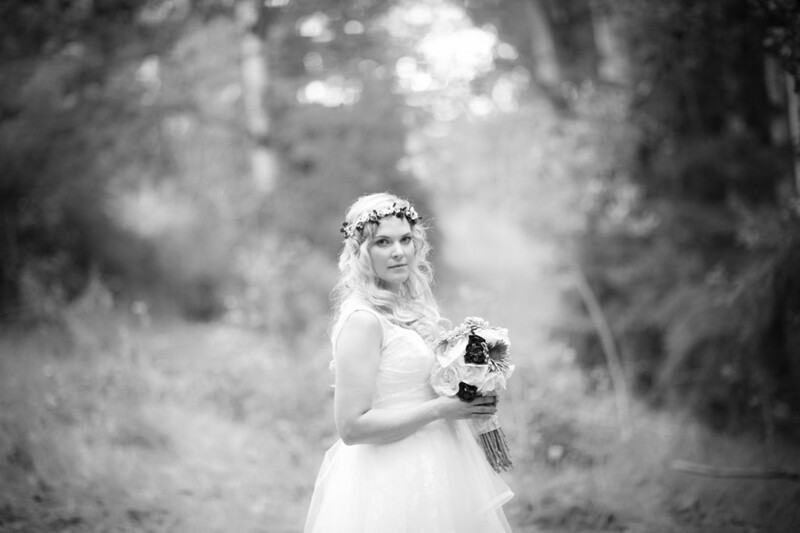 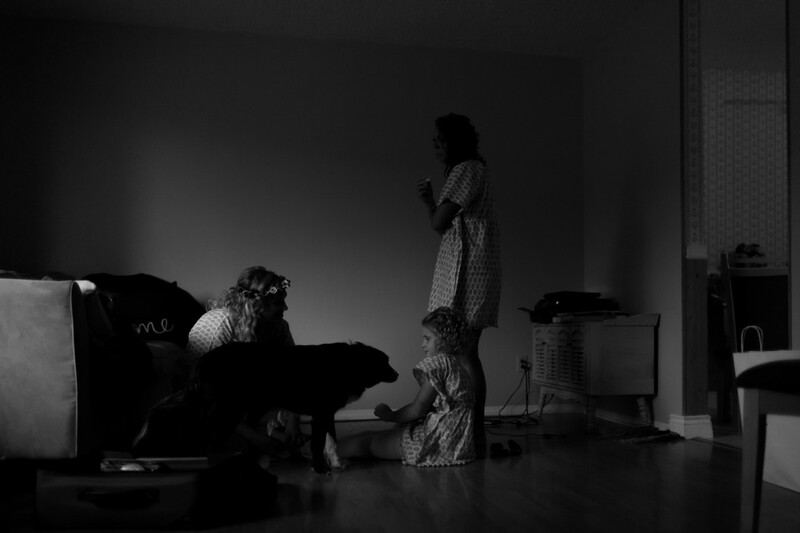 We love the rustic, country feel of these portraits! 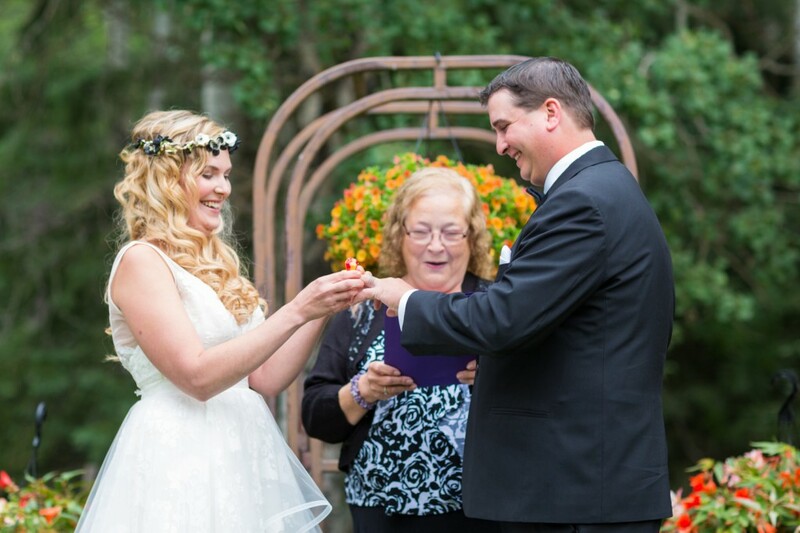 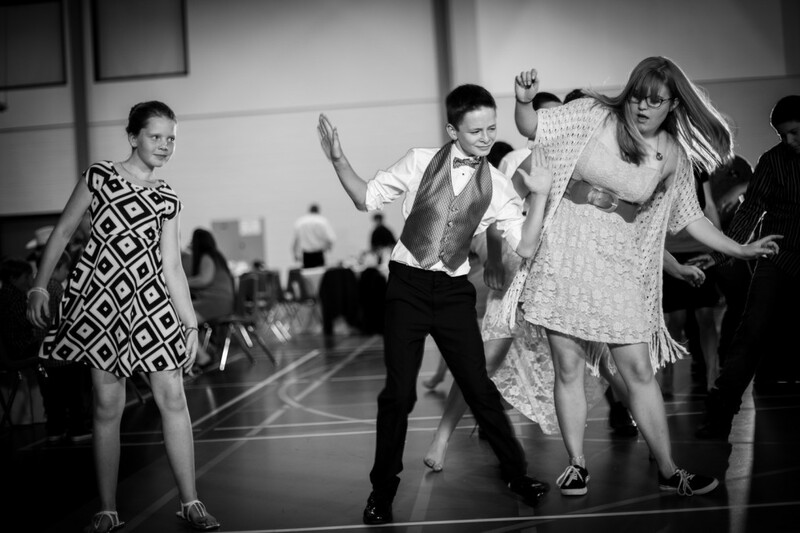 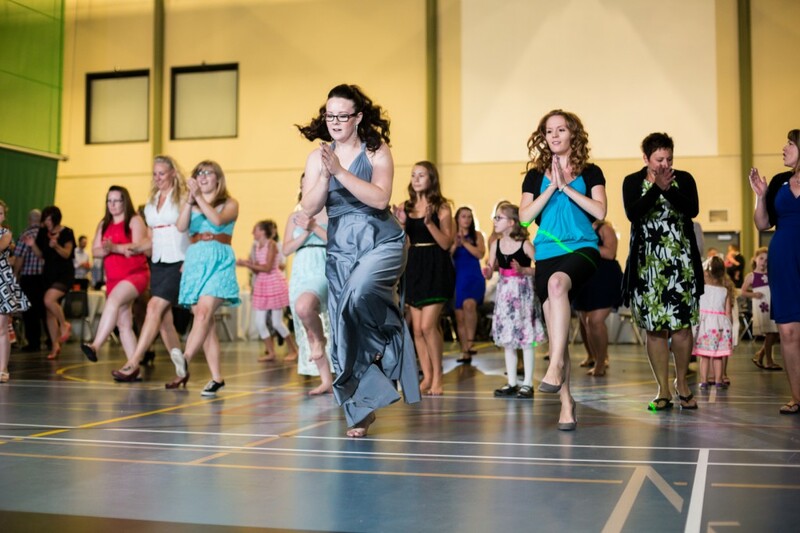 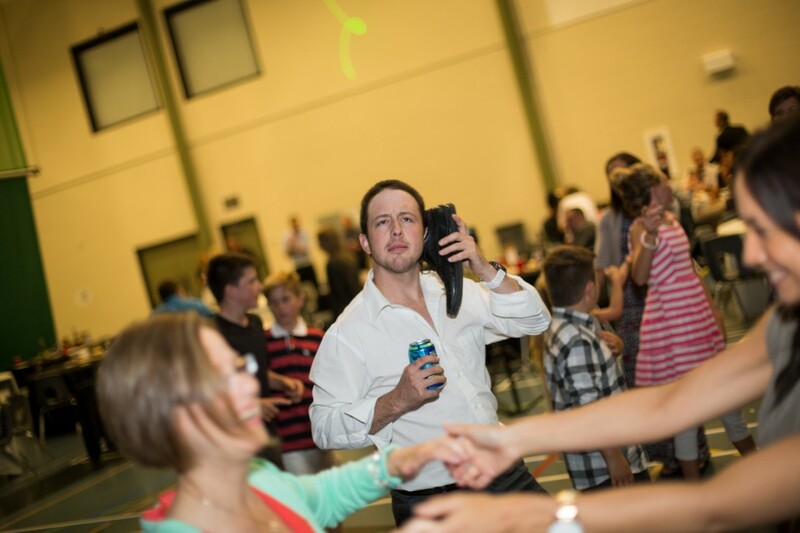 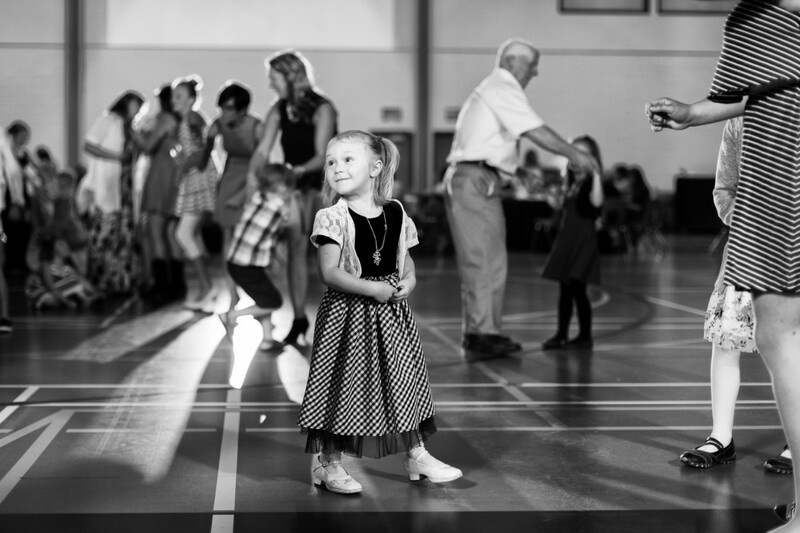 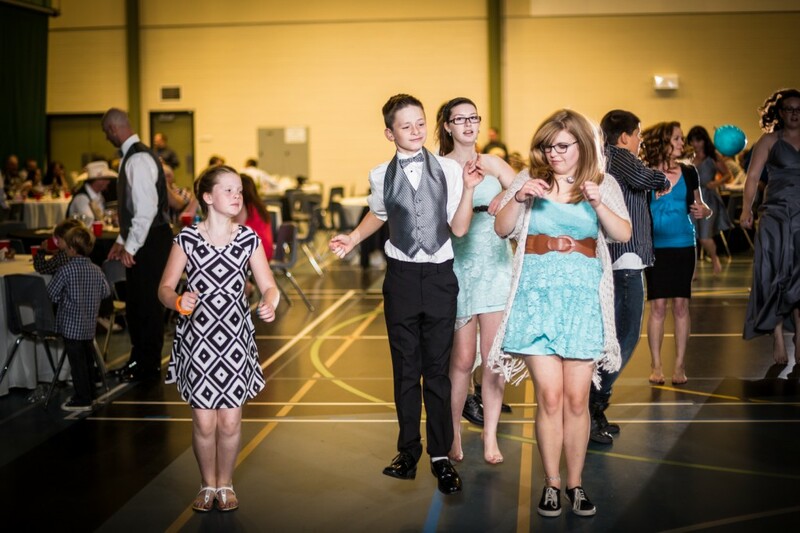 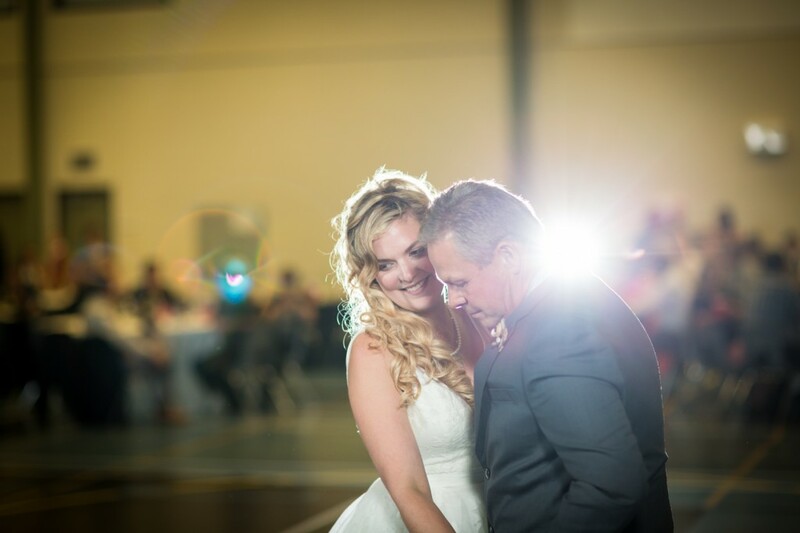 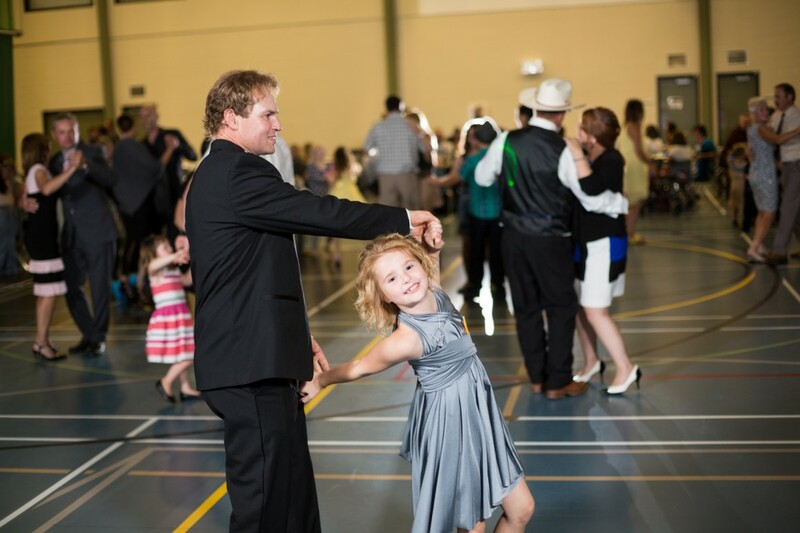 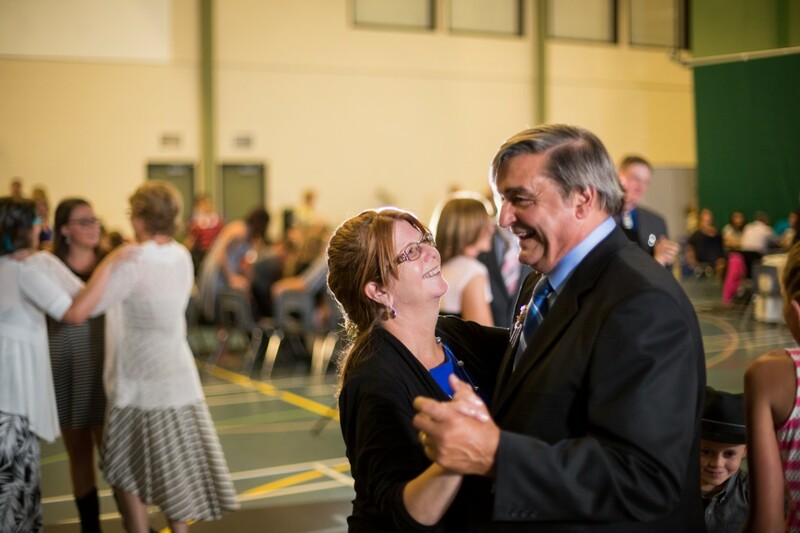 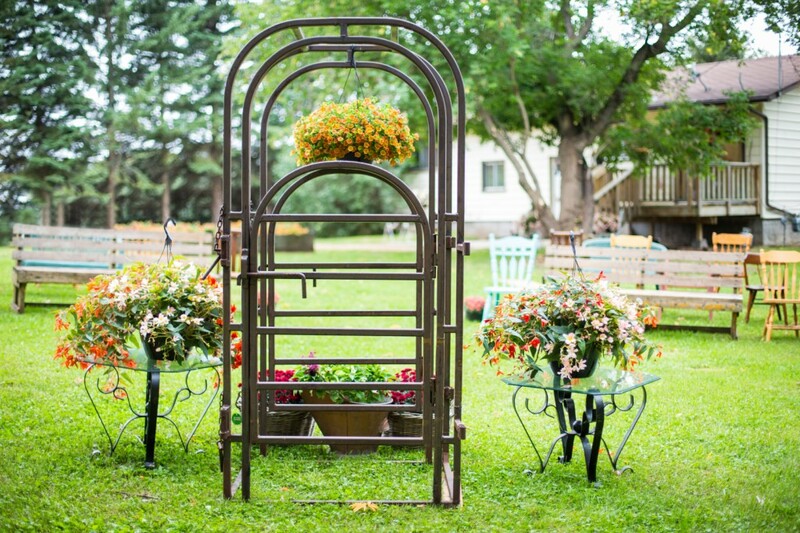 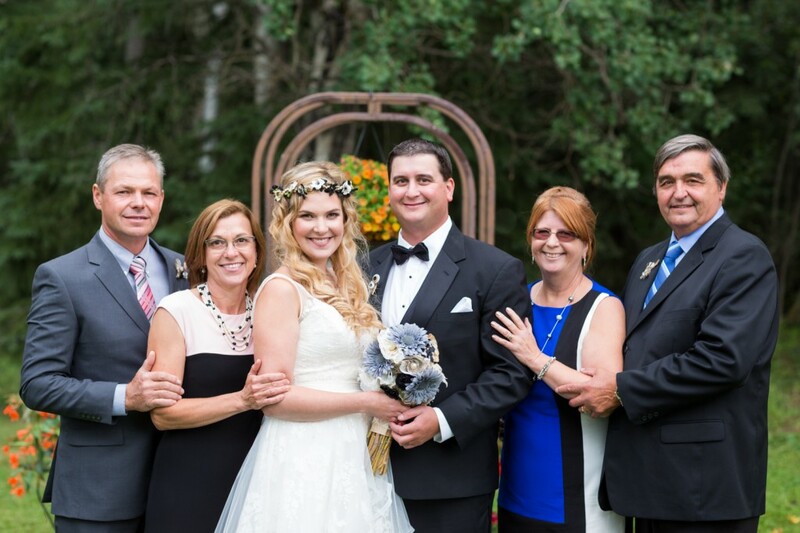 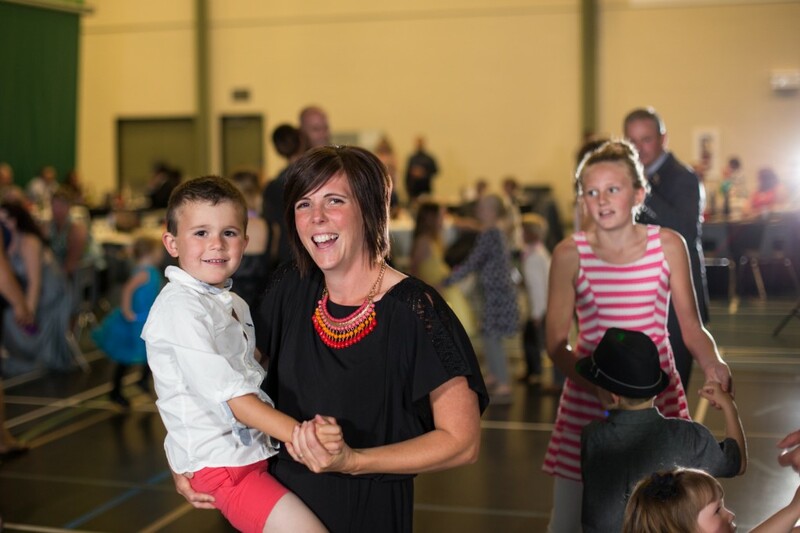 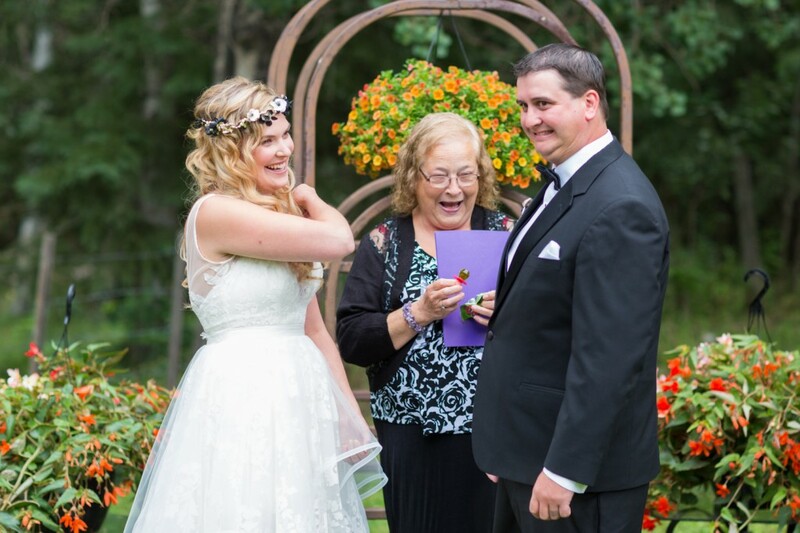 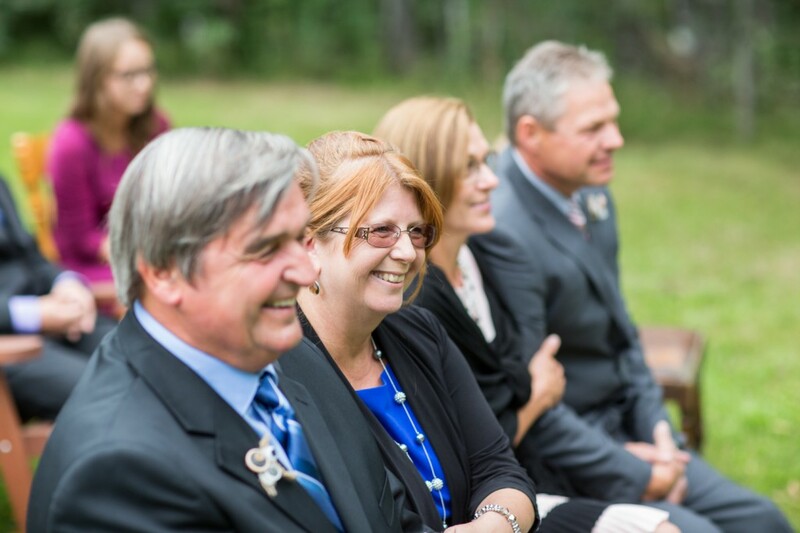 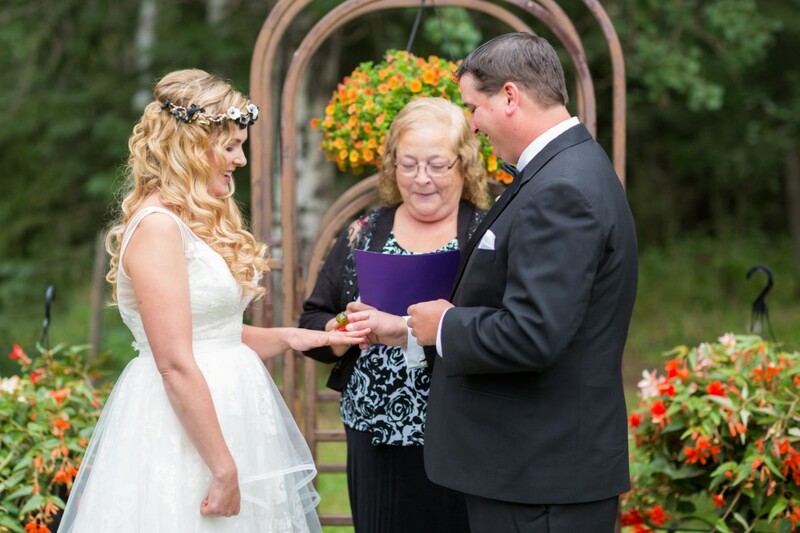 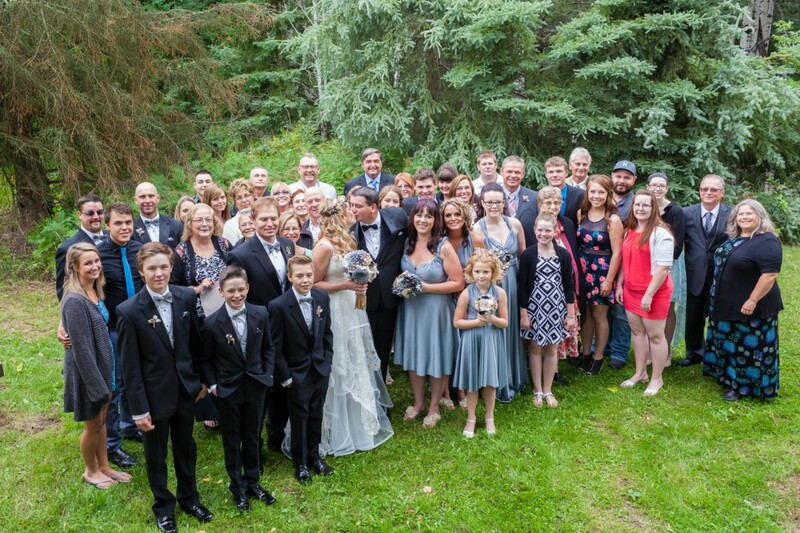 The lively wedding reception was held in Athabasca, where nearly 200 guests joined the wedding celebration. 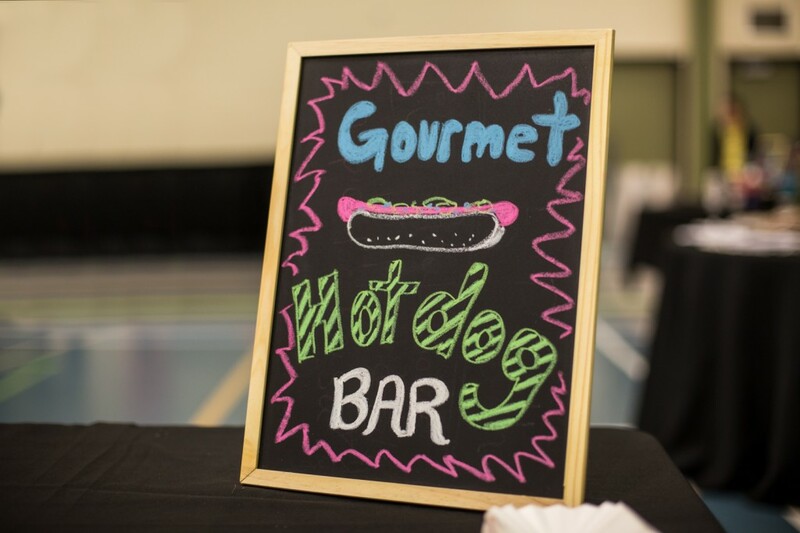 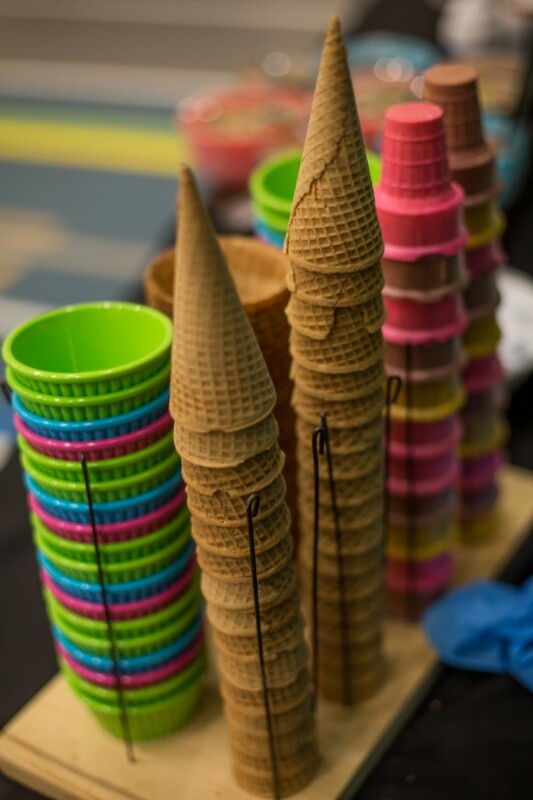 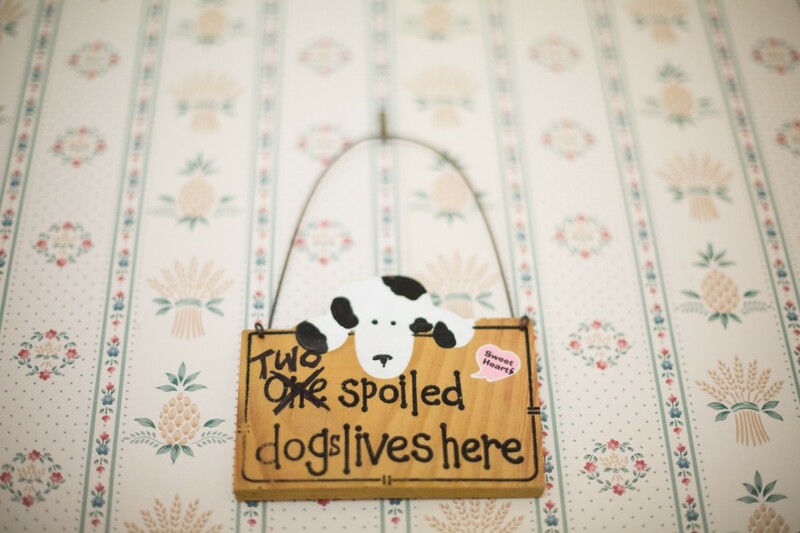 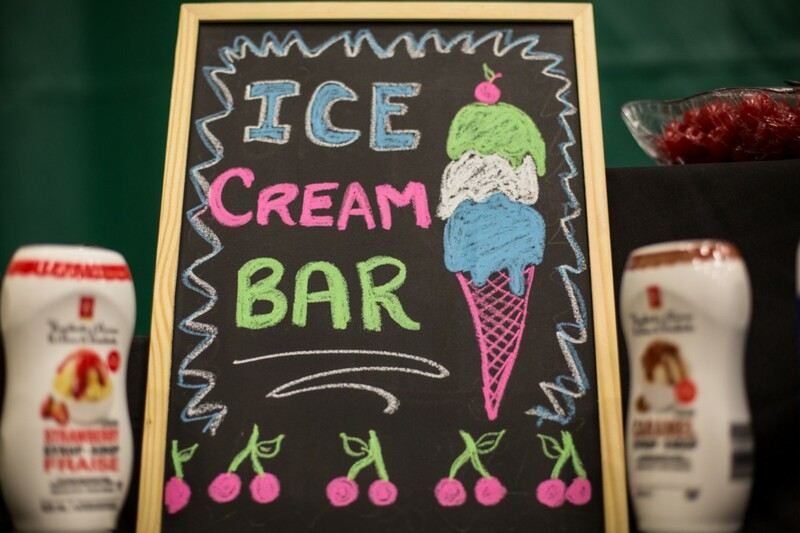 Kris and Kelsey’s creativity and love of food was evident in their hot dog bar for dinner and sundae bar for dessert. 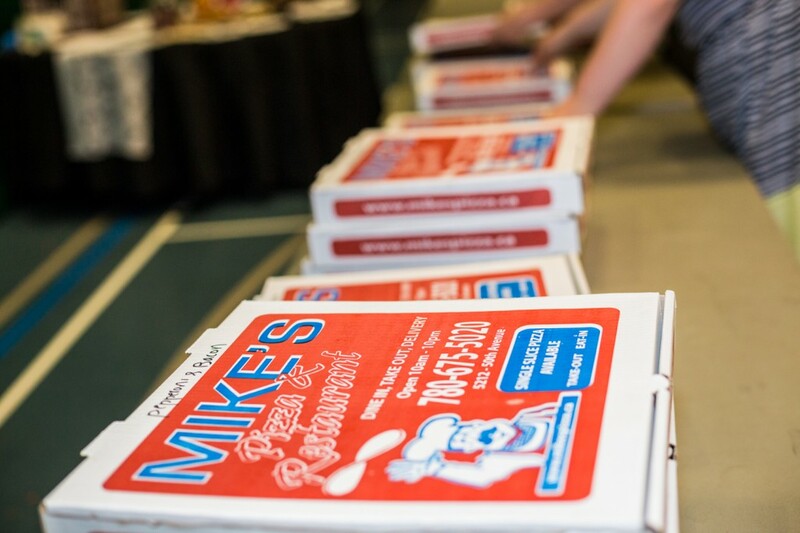 The celebration of love and family was fuelled by great music and Mike’s Pizza which kept the party going late into the night. 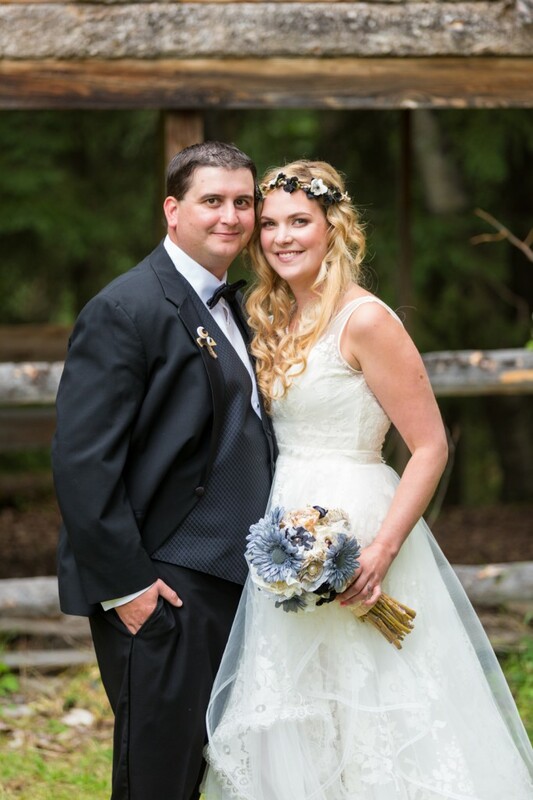 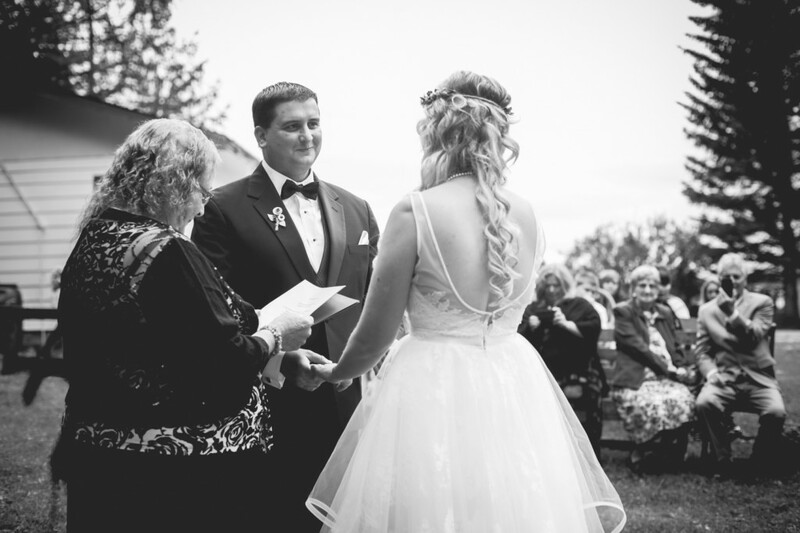 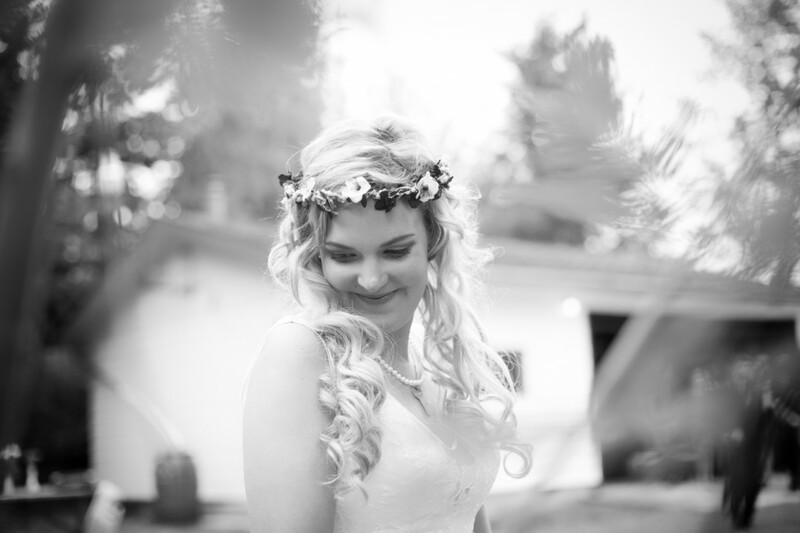 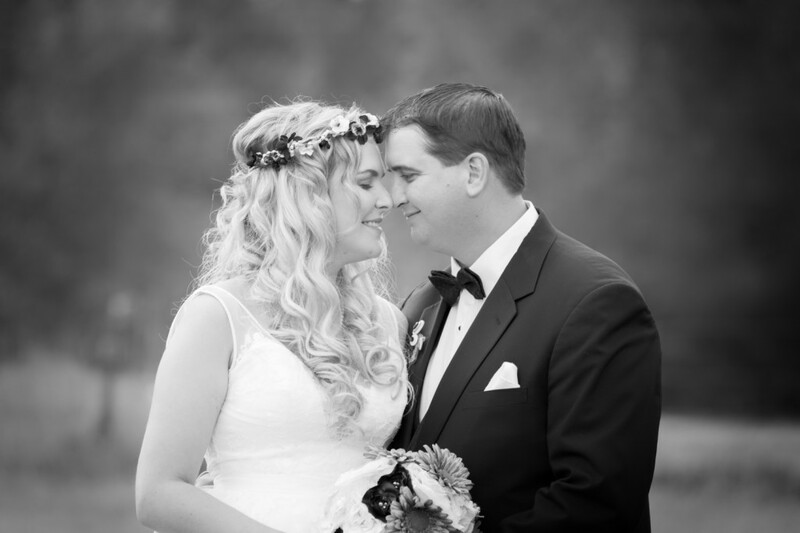 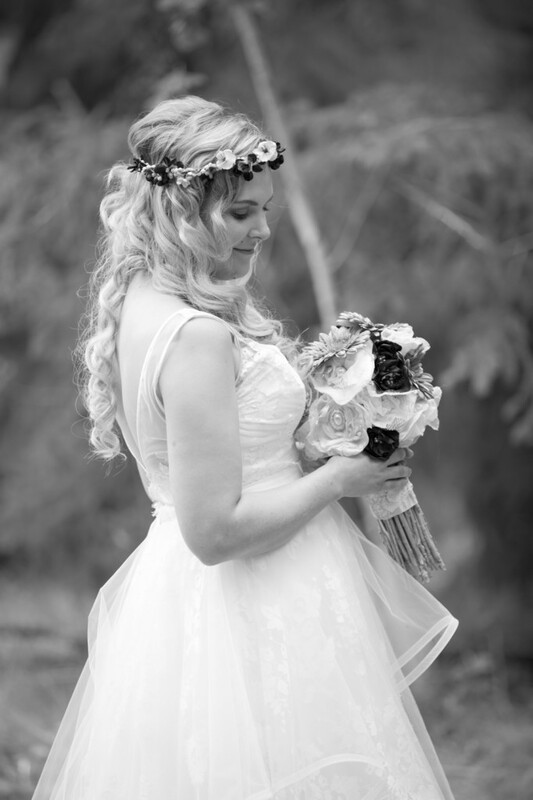 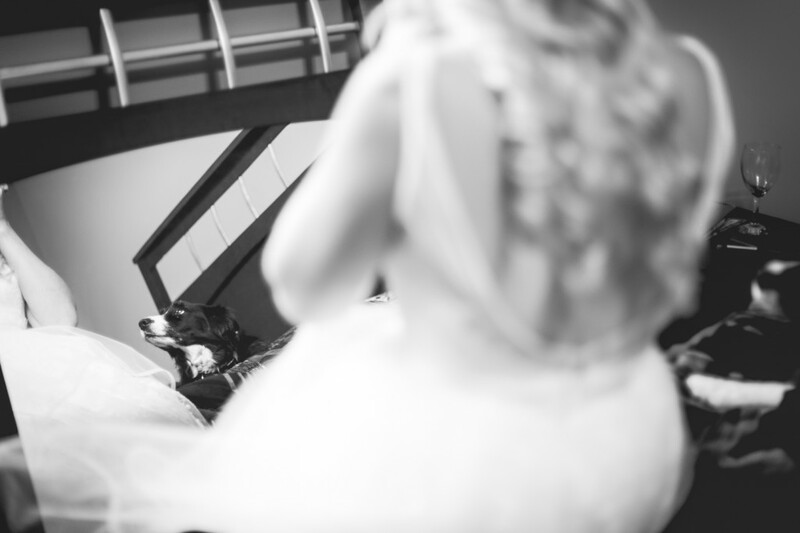 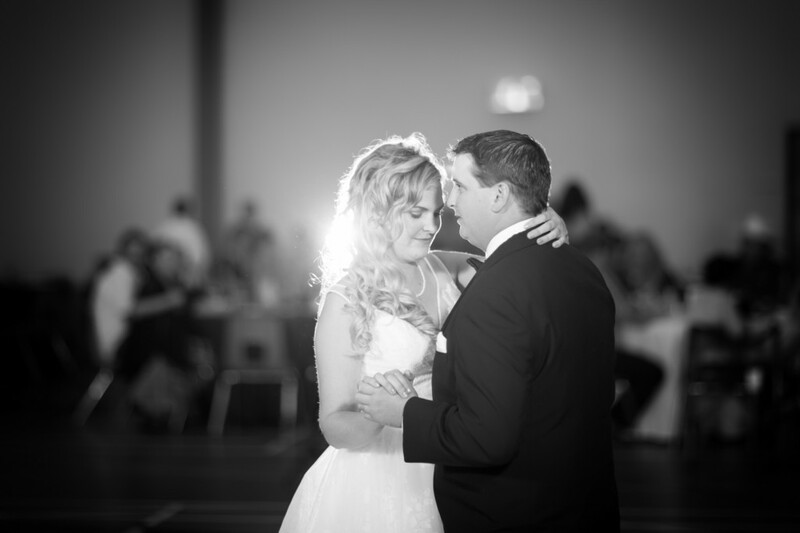 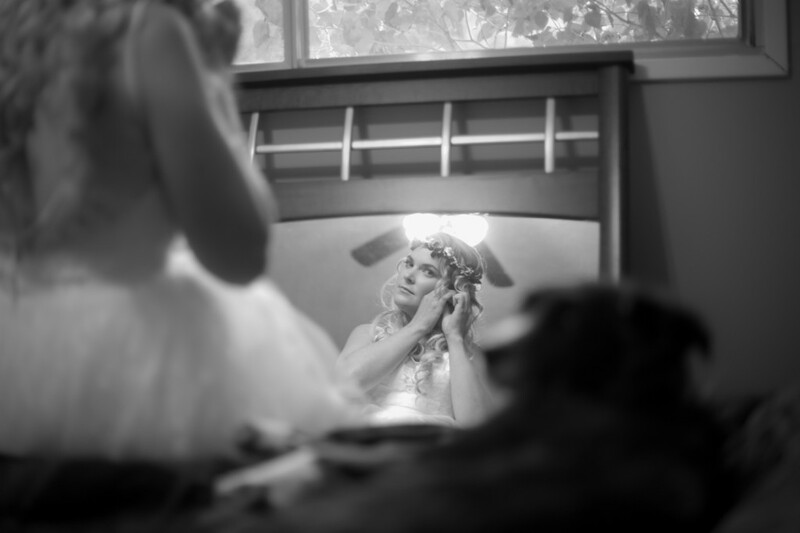 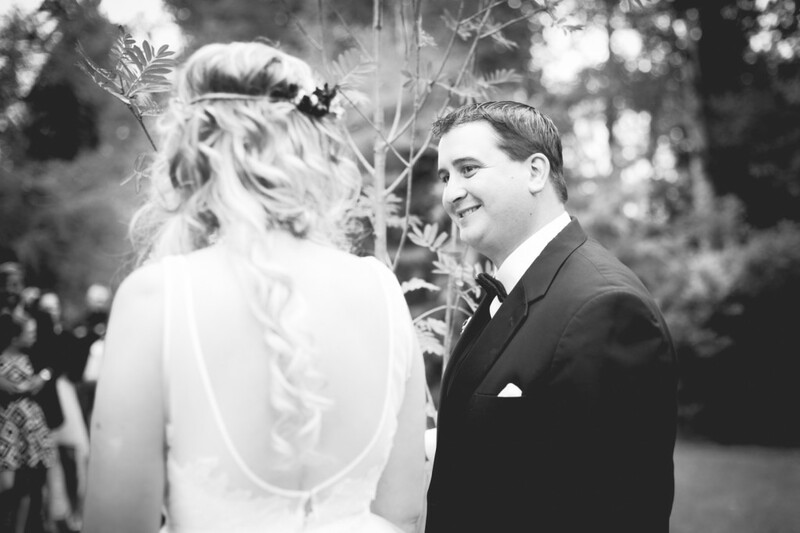 Thank you for inviting Deep Blue Photography to be part of your beautiful country wedding! 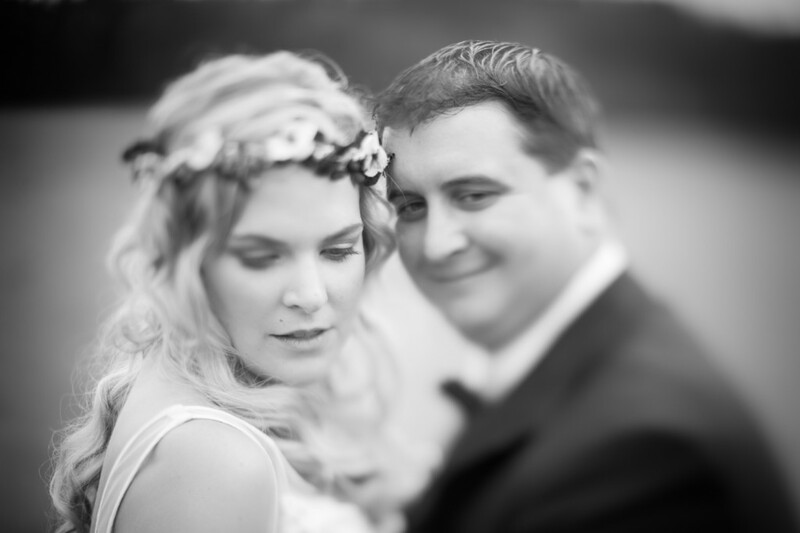 To see Kris & Kelsey’s engagement photos, click here.